1S. Y. Choi, T.-J. Lee, M. Y. Chung, and H. Choo (e-mail: choo@ ece.skku.ac.kr) are with the Department of Mobile System Engineering, Sungkyunkwan University, Suwon, 440-746, South Korea. 2S. Lee is with the School of Information and Communication Engineering, Sungkyunkwan University, Suwon, 440-746, South Korea. The Ethernet passive optical network (EPON) is an emerging technology for the next-generation broadband access networks and is considered an up-to-date candidate network for future fiber to the home. 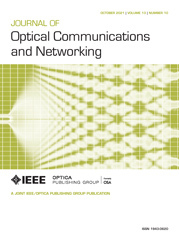 A crucial issue in EPONs is the sharing of uplink bandwidth among optical network units (ONUs). To manage resources efficiently, research on polling schemes based on multipoint control protocol has been conducted. We propose a novel polling algorithm to increase resource utilization by partitioning ONUs into two subgroups with some overlap. In the proposed scheme, after receiving frames from ONUs in one subgroup, the OLT performs dynamic bandwidth allocation for ONUs in the other. Hence, the OLT continuously receives frames from ONUs without significant interruptions. Comprehensive computer simulation results show that the proposed algorithm both defers saturation points of queues in ONUs and provides outstanding network throughput compared with previous work. It has up to 45% lower average packet delay and maximum performance improvement of 17% with respect to network throughput. a Condition of network traffic from end users to ONUs.